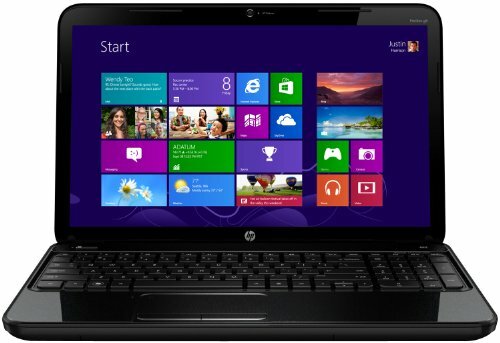 Below is our review of the HP Pavilion G6-2252SA, a 15.6" laptop, featuring 4GB RAM, 750GB hard drive and Windows 8. The HP Pavilion G6-2252SA notebook offers a 15.6" display, together with an Intel processor and 4GB of RAM, all encased within a sleek glossy black case. In terms of design, HP have opted for a fairly traditional approach, with straight lines and rounded corners. At approximately 37.6cm long, 24.4cm wide and 3.6cm high, it's not the smallest of notebooks - in fact the weight is 2.5kg, which is a touch heavy for a laptop of this price range. It should still fit inside a moderately size backpack though, so can still be considered pretty portable. The lid of the notebook features the same shiny finish as the majority of the rest of the HP laptop range - it looks good straight out of the box but can be prone to showing the odd fingerprint. As mentioned, this laptop features an Intel processor at it's heart - the Core i5-3210M model operating at 2.5GHz. This is further backed up by a solid 4GB of RAM, which during the test period offered speed, and did not noticeably slow down despite opening several applications at the same time. Boot up time was pretty fast too - the installed Windows 8 loaded fast and ran smoothly. The keyboard spans the entire width of the notebook, providing a comfortable typing experience. Also features is the practical inclusion of a number pad, which should make numerical input a bit easier for the number crunchers amongst us. The touch pad is located slightly to the left of centre, to be in-line with the centre of the keyboard - it offered a good level of control during the test period. Storage is catered for by a substantial 750GB hard drive, operating at 5400rpm, which provided speedy access to our files, both in terms of writing and reading. In terms of size, this should have more than enough space than the majority of users will require. In terms of connections, you are supplied with VGA, HDMI, 3 USB ports, headphone and microphone jacks, multi card reader and DVD drive, as well as the DC in power socket. The 15.6" display offers a decent picture - none of our testers had any issues with this aspect of the notebook, with colours being reproduced accurately and crisply. So overall, what did we think of the HP Pavilion G6-2252SA? Pros: Decent specification for the money, ran well during the test. Cons: A touch on the heavy side. The HP Pavilion G6-2252SA offers good value, and although slightly heavy, it offers a lot of laptop for your money.